Skinning is the process of creating an association between a Mesh (the Skin) and a Rig. More specifically in the Skinning process we define associations for each bone of the Rig’s Skeleton to each vertex of a mesh. 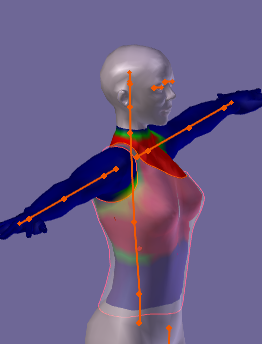 In practice, for a polygonal mesh character, each bone is associated only with a subset of the character’s vertices. Portions of the character’s skin can be influenced by 2 or more bones, where each vertex of the affected area gets an influence factor to each associated Bone. This factor is also called Vertex Weight. Thus the influence of each bone on a specific Vertex is defined by its Vertex Weight. Th Weight Copy panel is only available for Custom meshes that are already bound to an Avastar Armature. This panel is used to create additional weights or replace existing weights for your meshes. The weight Copy panel is admittedly complex. However it is still well organized and once you understand its elements and how they interact, weight copy should no longer be a mystery for you. 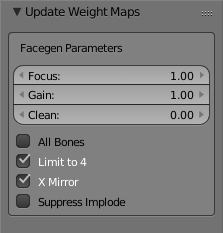 Important: Weight maps can only be reliably created for custom meshes. 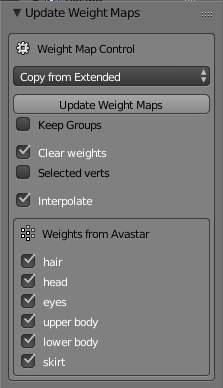 Hence the Weight map control section is not shown for the Avastar system Meshes. 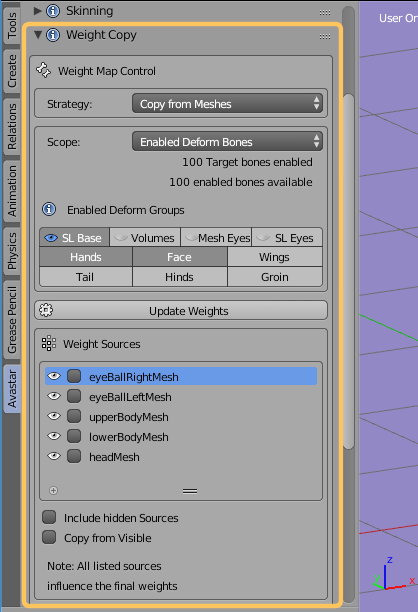 When binding a mesh to an Avastar rig you have access to a simplified user interface of the Weight Copy tool. This is for creating initial weight maps for your mesh(es). In the image on the right you see the armature (orange) and the shirt(semi transparent) selected. In this example the weight copy will project the weights of the upper body onto the weights of the shirt. For more detailed information see the Reference guide Binding(Assign to Armature). 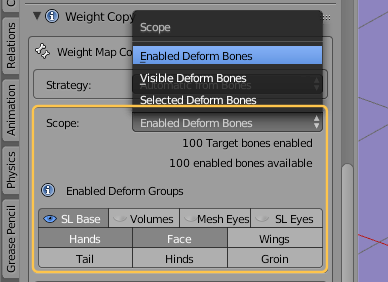 All enabled deform bones contribute to the final values in the weight maps, while the target weight maps only say for which bones weight maps can be created. In summary: The final data in the created target weight maps largely depends on the set of enabled deform groups. Remove all weights before generating the new weight maps. 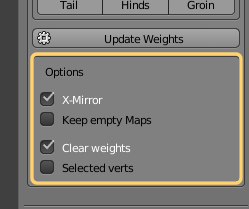 When you use the weight map controller in edit mode then you can create weights only for selected vertices (see below). 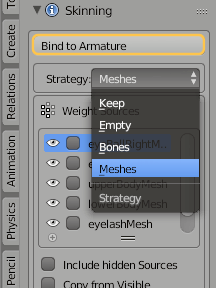 In that case you might want to keep the weights intact for all other (not selected) vertices in the mesh. this is the situation where you might want to disable this option. The character in the center gets the full treatment of mBone weights plus mesh deforms (shape keys). This character is equivalent to the default Avatar in SL using the same Gnome shape. This is a very special setup for an interactive face weight generation. Yes, this is only for creating weights for the Bento face bones! We have added Special weightmaps for Head and upper body which take care of the weights for the face and the hands. 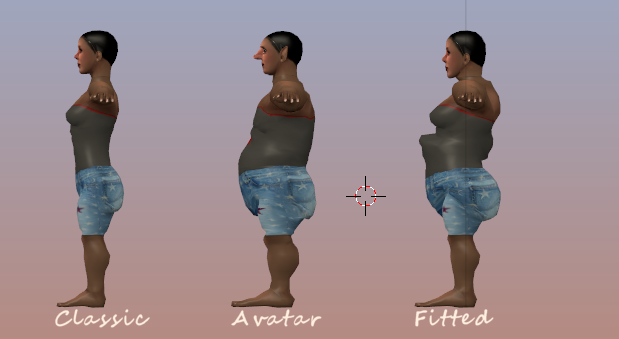 Note: Those weight maps have been created manually and they are just meant as proposal for your meshes. You will need to fine adjust the weights in any case! See below for the description of the extra options . 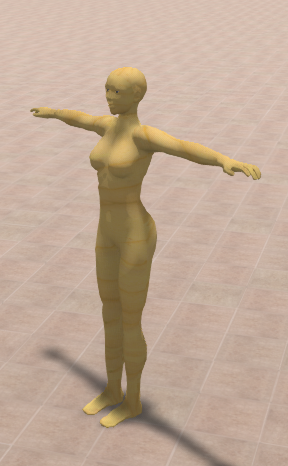 Use the Avastar character Meshes as Weight Sources. 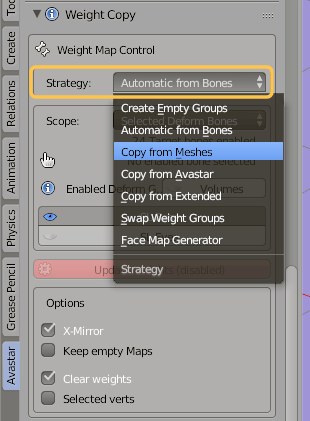 For this option you can exactly specify which of the Avastar Dummy Meshes shall be taken into account. it does not matter if the Avastar meshes are visible or not. 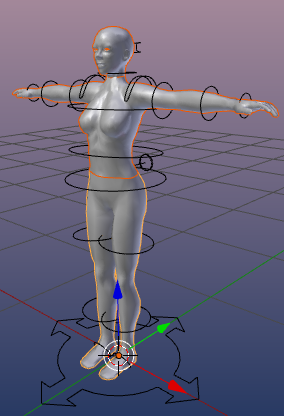 Use All meshes which are also attached to the same Avastar Armature and which are currently Visible. 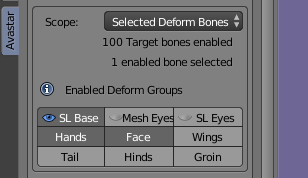 Use Blender’s internal Weight generator by calculating the weights from the Bone configuration. This works remarkably well in most cases. However you often need some minor adjustments especially where the Custom Mesh shall behave similar to the underlying SL Avatar mesh (for tight clothes). Checks all deform Bones for existing Weight Groups. Adds missing Weight Groups as empty Groups where needed. Clear weights: Normally the weight copy is additive, that is, when Weights already exist in the Target mesh, then weights which are not copied from the source but exist in the target will be kept. When this option is set, the source weight groups will be cleaned before the copy takes place.